These are the reviews for 37 Ocean Park. There are 32 reviews. Everything was done in a professional way , from the instructions to the welcome tray the views the cleanliness top marks and will definitely recommend to family and friends. This is a fantastic place to stay great views of the surrounding coastline.With some of the best beaches and old worldy places to visit just an hour or so drive away. This apartment has stunning sea views across the bay.It is spotlessly clean and tidy.Everything is provided including spare bed linen,pillows etc.Plenty of maps of area provided and instruction for heating,recycling general usage.Will Return!Highly recommended ! Excellent property was very easy to book with friendly staff via the telephone, have visited there several times over the last few years more like a home than a holiday let very well equipped with everything you need and spotless WiFi a big bonus. Very comfortable and quiet with stunning sea views and close to the sea and local shops an ideal base for exploring North Devon. Trolley to transport luggage via the lift extremely useful, was contacted by the owner several times prior to our holiday to ensure we had a good holiday even down to texting to inform us of the fire alarm testing. Will definitely be returning in the future it's our favourite holiday destination, must be as we've been so many times. This property is best described as five star.The owners make contact and ensure all your questions are answered prior to departure. The apartment was immaculate, tastefully furnished, spotlessly clean, a well equipped kitchen, with a comprehensive shelf of information, maps booklets, local attractions, history and geology. Its in a prime position with great views and easy access to the town. It is secure and the whole building is well maintained. Westward Ho! is one of the friendliest towns we have ever visited and the local walks are so interesting. There are many excellent restaurants as well. Please congratulate the owners and we look forward to making a return trip soon, as do many of those who have been there before, looking a visitor book! It was a lovely apartment with fantastic views. The owners were really nice and contacted us before our holiday to make us feel welcome. All the information we received before and following the booking was great. We had a wonderful holiday. We had a really lovely break here. The apartment was very comfortable, and spotlessly clean, We spent lots of time just looking at the wonderful view of the sea and countryside from the balcony windows. On arrival, the tea-tray and milk in the fridge were very welcome and added a more personal touch. 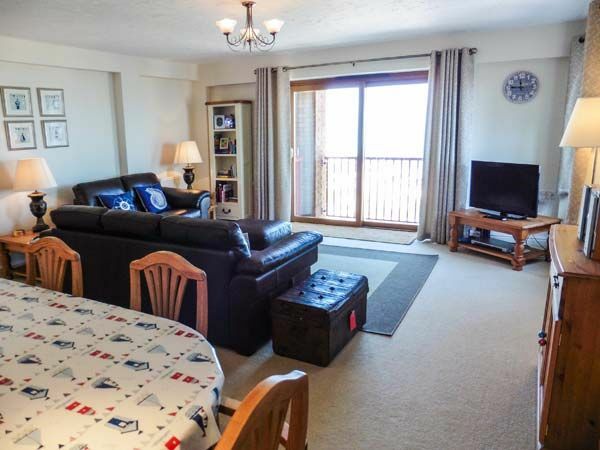 We would certainly recommend this apartment to our family and friends, and we will look forward to returning ourselves in the not too distant future. We had a wonderful stay in this spacious, modern and very well equipped, clean and comfortable apartment. The views from the property are fantastic. 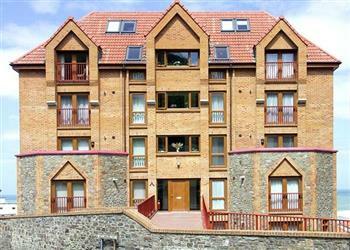 Set within a very convenient location close to all amenities and the sea. We shall definitely return and recommend to family and friends. Great location with proper sea view, spacious, nice and clean, well maintained. Stuff left for our use in the kitchen, interesting books and guides, Wi-Fi. The apartment was fantastic. Very high standards in terms of cleanliness, furnishings and general facilities. The views of the sea and beach were superb and was in a great location in Westward Ho! We enjoyed every day of our holiday and didn't want to leave. A lovely place with stunning views. An extremely clean and comfortable apartment in a lovely location, with consideration given to all requirements for a real home from home holiday experience. Would highly recommend. 37 Ocean Park is a really excellent accommodation. The property is in an amazing location with fantastic views. It felt friendly and a home away from home. The views were outstanding. The property is even better than the photographs show which is a rare thing. Westward Ho! has a village feel and there are plenty of places to eat if you wish. This is the second time we have stayed at this property and. once again we thoroughly enjoyed our stay. (This apartment is so lovely and comfortable that we could live in it permanently!) The cottage is extremely well furnished and the kitchen provides everything you could require! The best part was sitting looking out to sea from morning til' night. Amazing views. The accommodation was excellent and the views of the sea were spectacular. The flat was very well equipped - it had everything you could wish to have to make a comfortable stay in Westward Ho! Our stay in this delightful apartment was all we had wished for and more. It was a home from home! It is excellently located boasting views of the beach from the lounge left hand window and the whole of the bay, with Lundy in the distance from the large lounge balcony window. Managed to photograph some breathtaking sunsets from the balcony. 10/10, we will be spreading the word. A spectacular property, definitely hope to book again in the future. 37 Ocean Park was excellent, very homely and very well equipped. Was situated in a great location with great views of Westard Ho! Would recommend this apartment to friends and family. Some family staying in a different apartment came to have a look and they also really liked it. Would book this apartment again. The property was well set up with everything needed, the little extras made the ordinary extraordinary. The accommodation was conveniently sited for all amenities and transport. It was warm, clean, welcoming and had lovely views for the few occasions that we were not out exploring. The area had an abundance of walks and other things to do. Second visit to this spotlessly clean, well equipped and well presented apartment, with just the most amazing views across Westward Ho! bay. Attention to detail is paramount and this apartment does not disappoint. Always a pleasure to return to Ocean Park. Excellent apartment with stunning views. Have already recommended property and Sykes to friends and family. The position, the layout, everything exceeded our expectations. So many thoughtful touches that we never imagined we would ever get in a holiday cottage. We can't praise this property highly enough. Both the overall condition of the property and the location were excellent. The view from the lounge is stunning. Me and my partner stayed here for 3 nights for our 3rd year anniversary. We were told about the apartment from family who had previously been on vacation here before, and it was everything and more that we expected it to be. We were really impressed by the service that we were given, friendly, welcoming and reallyhelpful. The apartment was immaculate and has everything you need to make you feel at home. Being on the top floor the views were sensational overlooking the ocean and the beach and in the evenings you have a great view of the sunset where we had plenty of glasses of wine out on the balcony. An added bonus was that the block has a lift which also has a trolley which you can use from your car if you have loads of luggage which was really handy we we arrived. The area itself was perfect for a romantic getaway, plenty of fantastic coastal walks which if you have the minerals can carry on for miles, great places to go and eat, we would highly recommend going to the Pier House for an evening meal, the service, food, prices and views were spot on! All in all a really relaxing, healthy and satisfying stay, a big thank you to the owners Denise and Tim! First class accommodation with high quality fixtures and fittings and an astonishing view. It was spotlessly clean. By far the best holiday accommodation we have stayed in - and we have stayed in many over the years! As a family we know Westward Ho well in my case from my teens. So to find this flat in this location at a reasonable price in august was brilliant. Quality is the word that describes the flat its contents the layout the facilities with a view over the Bristol channel towards Lundy Island a dream.You could not be disappointed with the combination of the flat itself its comfortable layout beds and settees and chairs and the fabulous views from Woolacombe Bay to Hartland point what a vista-just amazing. Being able to watch surfers, swimmers and even golfers from the windows and veranda was both relaxing and exciting. Cleanliness ruled ok also internally a truly outstanding flat and holiday. This was our sixth holiday in this property, which is not only excellent in itself, but very convenient for exploring an interesting area. On a purely personal level, being disabled, it is ideal, with lift access from the parking area to the flat. If you're looking for other cottages around 37 Ocean Park, we've got some cottages below which may take your liking. There are 98 cottages within 5 miles of 37 Ocean Park - and they have reviews too.